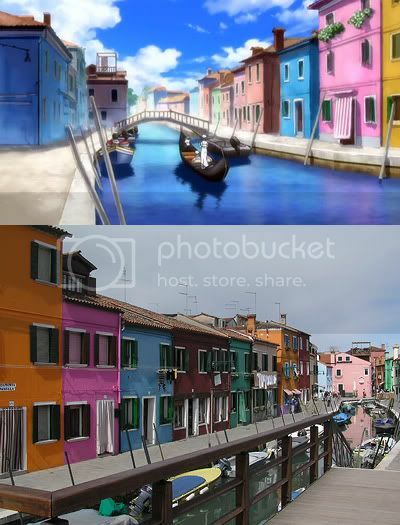 The island of Burano features in ARIA the Origination Ep07. This island is pretty far from the main island of Venice and takes approximately an hour on the Vaporetto (water bus). 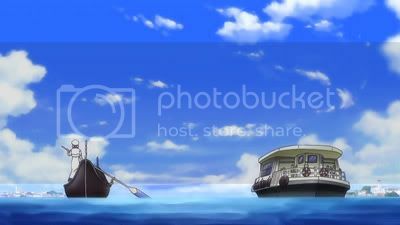 In ARIA though, we see Akari rowing a gondola and a very rough speed estimate calculation gives an estimate of 4 hours. 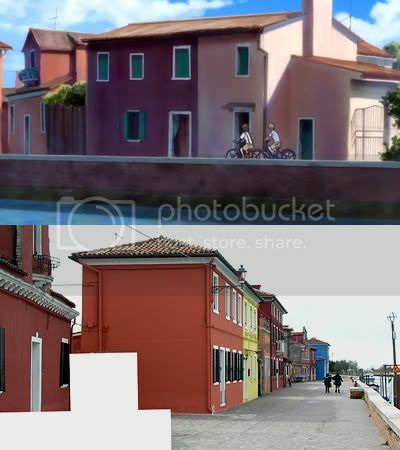 Burano is linked by a bridge to the island of Mazzorbo and from my observations, the production crew included elements of Mazzorbo into episode 7 as well as Burano. An example is the below picture this scene is unique to Mazzorbo and not found in Burano. Although I have no suitable picture, Peorth's Anna's bungalow house is also in the style you'd find on Mazzorbo, with its fenced gardens. Burano itself is as densely built as Venice and you'll be hard-pressed to find a house like that. Most houses in Burano are in good condition, exterior wise because of the colourful pastels. A lot of buildings in Venice are in a state of semi-disrepair with the old, faded pastels falling away revealing the brickwork below, but not in Burano! 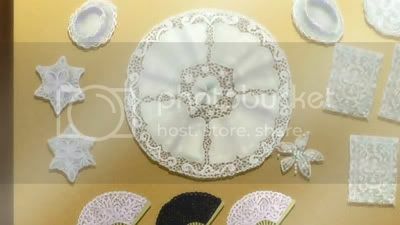 When it comes to laces, there are a countless number of shops selling lace merchandise. Even in a relatively isolated place like Burano, it still gets plenty of tourists. The below picture shows the intricate details which the ARIA crew paid attention to, from the poles sticking out of the water to the cloth covering the doorways. Stuff on sale can range from simple handkerchiefs from €1 to more elaborate designs, with ARIA giving a taste of what is on offer. Unfortunately though, the art of lace-making is a dying breed. Lace-making began from as far back as the 14th Century with the Doge's wife (I think the Doge was mentioned somewhere in ARIA). Although Napoleon's invasion halted the lace-making for a while, it was ressurected with a lace-making school opening in 1872. It has since then closed in 1970 and the number of women still practicing lace-making is dwindling fast (Simonis 2008, p166). *writes down* Venice must-see No.2: Burano... 'kay. Another long and interesting post. Keep up the good work, I love reading these. And, there was a place where you didn't go in the Lagoon? Thanks for the comments. I did not get to go to the Lido (Beach area) and the small island of Torcello which is a short Vaporetto ride from Burano. Unfortunately, there is only so much I could do with a rather pricey 24 hour Vaporetto pass. Fortunately, I don't think ARIA touched upon these two areas. How do you manage to take pics that so closely resemble screenshots! 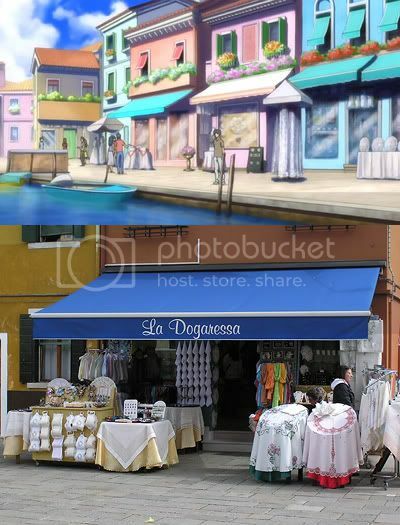 Ah everytime I read your posts, makes me want to go to Venice more and more. I think I will soon too. Purely coincidential. I only re-watched Aria [b]after[/b] my trip!